Rosalind Thorne has slowly but assuredly gained a reputation as “a useful woman”—by helping respectable women out of some less-than-respectable predicaments. Her latest endeavor is a tragedy waiting to happen. Desperate Margaretta Seymore is with child—and her husband is receiving poisoned pen letters that imply that her condition is the result of an affair with the notorious actor Fletcher Cavendish. Margaretta asks Rosalind to find out who is behind the scurrilous letters. But before she can make any progress, Cavendish is found dead, stabbed through the heart. 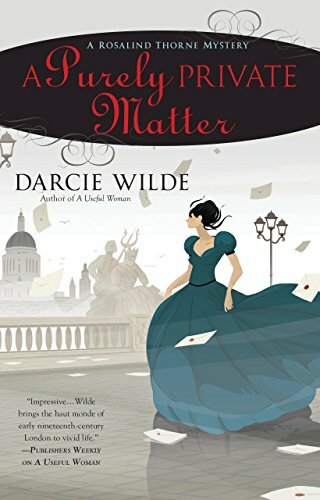 Suddenly, Rosalind is plunged into the middle of one of the most sensational murder trials London has ever seen, and her client’s husband is the prime suspect. With the help of the charming Bow Street runner Adam Harkness, she must drop the curtain on this fatal drama before any more lives are ruined. Find out about Darcie Wilde and her books on her webpage here.